This card is so bad, it's time for a rant: Excellent work, Fleer. Once again, you fine folks have outdone yourselves. What a photo choice. So much action. Mike Griffin just jumps off the cardboard and into our living rooms. Few things in sports are more exciting than a pitcher hanging out in the dugout watching a game. Riveting stuff. And don't worry about getting a shot of this guy in his real uniform. Collectors everywhere prefer shots of guys that make them look like they're on a beer league softball team. We must give you kudos, however, for choosing to keep the random flannel guy in the crop. Totally necessary. 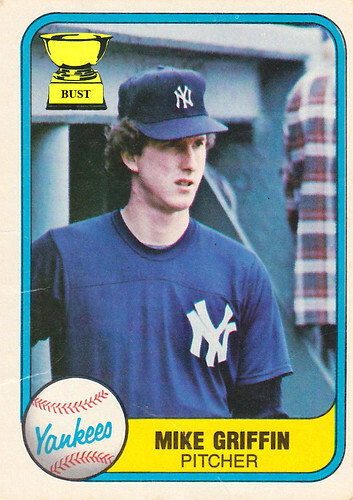 Well, at least this card has one redeeming quality: Griffin looks a lot like Larry Bird.